Located on a heart-shaped island, Hilton Moorea Lagoon Resort and Spa offers luxury accommodation nestled between two bays. Featuring unique bungalows surrounded by exotic flowers or suspended over the turquoise water of the lagoon, the resort offers an outstanding range of onsite facilities. Boasting picturesque lagoon or tropical garden views, some accommodation enjoys access to their own private plunge pool. The resort is surrounded by a variety of activities and attractions and is just a short drive from the Moorea Airport and the Moorea ferry wharf. 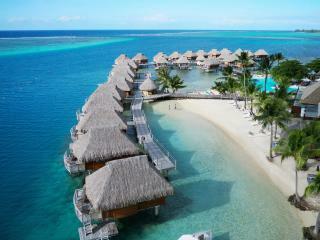 Hotel Hibiscus is great value accommodation located near Tiahura Beach in the region of Moorea. 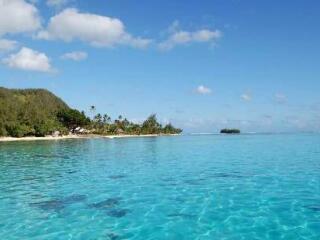 This Tahiti accommodation is close to Tiahura Beach and Tiki Village Cultural Centre. 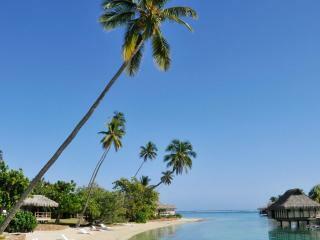 This beach hotel is also within the vicinity of Pihaena Beach and Moorea Tropical Garden. Facilities include restaurant & bar, coffee shop / cafe, swimming pool, free WiFi and tour desk. 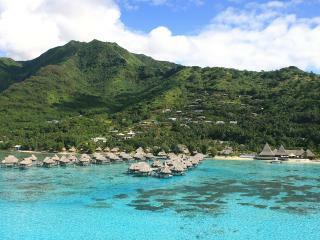 Nestled between a turquoise lagoon and scenic mountains, InterContinental Resort and Spa Moorea offers elegant accommodation with an authentic French Polynesian feel. Surrounded by 27 acres of lush tropical gardens, the resort offers the famous overwater bungalows as well as luxury garden bungalows with their own private plunge pool. Home to a fantastic range of onsite facilities, the resort is close to the airport, Tiahura Beach, Moorea Tropical Garden, Pihaena Beach and the Tiki Village Cultural Centre. The Moorea Dolphin Centre is also located onsite, allowing you to get up close and personal with dolphins. Located 15 minutes from the Moorea ferry terminal and 10 minutes from the airport, Manava Beach Resort & Spa Moorea offers well-appointed accommodation in a traditional, Polynesian-style resort. Offering an outstanding range of onsite facilities, the resort is just minutes from magnificent Cook’s Bay and features Tahiti’s iconic bungalow accommodation, including the famous overwater bungalows. Boasting a luxurious range of little details, some accommodation options also feature their own private plunge pool. Located only 5 minutes from the ferry terminal, Sofitel Moorea Ia Ora Beach Resort offers a haven of beauty and romance featuring 114 stunning bungalows overlooking a spectacular lagoon. There is choice of garden, lagoon, beachfront and overwater settings of bungalows beautifully decorated with traditional Polynesian accents. The resort offers a wide range of facilities and services including it's own dive centre, 2 outstanding restaurants as well as 2 bars. The breathtaking white sand beach will set the scene for an unforgettable experience.